The skyline of Kaballas' central suburbia was on fire. The brutal fighting between several mechanized armies had left the cityscape and countless military formations in ruins, and war was still creeping towards new high-value targets and the capital itself. Yet the ground warfare was not the only theater in the Kaballas World War. The military senate was about to burst with power games, conspiracies, opportunistic moves and revolutionary plans from several parties. Agents of chaos, patient cultists and power-hungry officials all yearned to exploit the frantic atmosphere. The two battles soon entwined as key figures in the imperial military senate as well as their heretic adversaries all despatched a number of Death Squads and specialized Kill Teams. These were met by the special forces of Alien invaders, all with their own motives and agendas. Conducting dozens of covert operations, these special units eliminated political targets, invaded key buildings, sabotaged hostile military detachments and destroyed opposing Kill Teams, all in attempt to gain the upper hand in the oncoming siege for Kaballas' capital. For hours the fate of the world and its military senate hung in balance, controlled by the prowess of the skilled fighting forces on its surface. Finally it seemed that the planetary senate would prevail. Aliens were being pushed back, heretics were detained and prosecuted and imperial reinforcements were performing with stern success. Even some of the invaders seemed to support the current military senate, probably attempting to gain advantage in their own battles against imperium's arch-foes or because they knew that the decisive coup was still to come. That was until a terrifying alien deity descended upon Kaballas Prime. The Necron troops supporting the C'tan being had first intercepted a Renegade Space Marine chapter's scout operations and then bested the fanatical servants of the Adepta Sororitas. As the C'tan entered the battlefield protected by its immense Tesseract Engine, the Necron Vaultguard Phalanx utterly annihilated the Ultramarine opposition tasked by the Kaballas' military senate and commanded by the Captain of the Second Company. Simultaneously a faction of the Tau Empire Farsight Enclaves had fought their way to the edges of Kaballas Prime and would now meet with the ancient threat. The eyes of the entire world were upon these two alien armies and their epic conflict. Concealed by the fog of war, in the distant Sector Manufactorum, a shadowy figure was conducting his own plans. Inquisitor Colfer had resurfaced and under the planetwide perturbation he was left in peace to continue the work of his organization. The satellite-powered comm-link would soon be operational and even though he hadn't got his original escape pod to work, the inquisitor could soon contact his allies. "The meaningful allies" Colfer thought, glancing at his current retinue of imperial militia, cult militants and renegade imperial cavalrymen. What a colorful bunch of armed rabble. But at least they had operational armor. As the satellite link was at its final stage of calibrations, Colfer felt his sixth sense tingling. The experienced xenologist left his work, threw the ragged trench coat over his shoulders and made his way to an old vehicle depot at the corner of the industrial block. Something in the air didn't feel right. It felt familiar, terrifyingly so. As the old inquisitor gazed at the horizon, he found the confirmation for his fears. The scions of planet Tyran were here. Colfer didn't hesitate. Alarm went off, the temporary command staff assembled and the Ordo Xenos inquisitor directed his unruly battle force into positions. The tanks rolled into their combat formation, infantry took cover, lasguns primed. Colfer joined the fire support platoon, armed with autocannons. 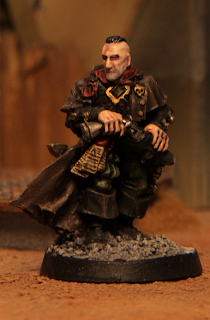 The inquisitor grabbed the long-las rifle of a nearby guardsman and gazed through its magnifying scope. Judging by the distinctive chitin texture and their primal coloring, the alien force was a splinter fleet of the infamous Hive Fleet Kraken. Colfer made sure the guard air support was being scrambled. The artillery begun its work. The horde kept coming. The air was now dense with the Tyranid spores Colfer had sensed earlier, making their way into the lungs, eyes and equipment of the human defenders. A shadowy figure circled around the guardsmen and suddenly swooped down to destroy guard tanks with its vile xeno weapons. Heavily armoured Tyranid shock troops made their way towards the guard defense line and infiltrating predators appeared from their hiding places to gnaw at the human morale. The renegade guard lines faltered. Colfer ordered his men to fire, pointing out vulnerable points in the monstrous figures, telling synapse creatures apart from their peers and warning his men of Genestealer ambushes before the alien beings emerged from their tunnels, but the battle was already lost. The Leman Russ engines were knocked over and infantry were being slaughtered as terrified Ratling snipers fled through the distorted ranks. A massive Tyrannofex climbed on top of a burning tank wreck and unleashed a terrible bio-weapon upon Colfer's platoon. The inquisitor felt hot acid splash against his face, the sheer force of the alien shooting attack throwing his form to the ground. Colfer was fading. He was being carried away by a renegade priest, apparently the sole survivor of Colfer's guardsman platoon. The inquisitor couldn't tell if the unbearable stench originated from the Tyranid fluids or from his saviour. The booming sound of a Valkyrie engine made Colfer slip away into the blackness. He was now airborne. Colfer slowly rolled to his side and saw four bodies accompany him in the transport space of the Valkyrie. The aircraft was performing evasive maneuvers which threw Colfer's aching body against the sides of the plane. The inquisitor gazed through the open side door of the Valkyrie and saw a flock of Hive Crones unleash half a dozen Tentaclids. "Frag this" Colfer whispered and closed his eyes. Darkness came, but it didn't bring the relief of death. Colfer couldn't open his eyes, but was all too aware of his broken body. He slowly regained his composure and tried to sense where he was. It was quiet and the hard surface he was laying on was not in motion. The Valkyrie had crashed down. The inquisitor knelt over the wrecked aircraft armour plates and held his broken arm with a bloody one. He could now see a bit through his left eye and hobbled into a standing position to leer at the surrounding landscape. The sight of a closing hunting pack of Kraken Termagants didn't even move him any longer. Colfer drew his master-crafted laspistol. The creatures ran closer, their razor-sharp teeth in a permanent grin, sinewy arms holding a smaller bio-weapon attached to their flesh. Colfer fired and killed the first creature - its pack-mates scattered into a looser formation. Inquisitor's second shot missed and the third scratched the forehead chitin of a Tyranid scuttler. He wouldn't have time for a fourth shot. In an eyeblink the entire brood of the alien creatures was blasted into oblivion in a coherent firestorm. The nearby Tyranid Warrior Colfer hadn't noticed was struck down a moment later, with a white-hot flamer burst directed at its twitching remains. Suddenly the Tyranid hunting brood was no more. Inquisitor Colfer sighed painfully and turned to face the hulking figures behind him. "It's about time for you to show up. Now get me away from this damned wreck." Rogue's Journal on fluffiartikkelisarja, joka seuraa inkvisiittori Les Colferin edesottamuksia War Headin yksittäisistä turnauksista koostuvan syyskampanjan aikana. Kunkin turnauksen tapahtumat kuljettavat inkvisiittorin tarinaa eteenpäin täysin ennakoimattomalla tavalla ja tarina heijastuu näihin artikkeleihin. Kuinka käy Colferin, mitä tämä pakenee ja mitä Kaballaksen järjestelmässä on tekeillä? Tarina jatkuu seuraavan turnauksen jälkeen!